I did finish the Jaywalkers socks, and hope to wear them soon. They are drying as I speak. This colorway wasn't too colorfast, my hands and needles came out stained after knitting with it. That's why I decided to give them a good wash first. 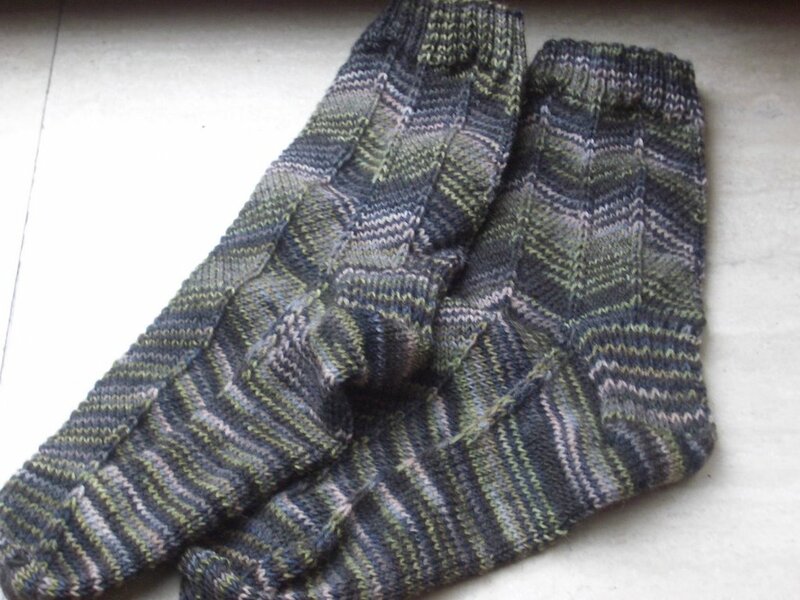 I frogged the brown socks. I didn't like the tiny cable in that dark color. And I lost a bunch of stitches when a needle slid out of the wip (work in progress) in my purse. I'll need to find a pattern better suited to this yarn. I have also been inspecting my stash. 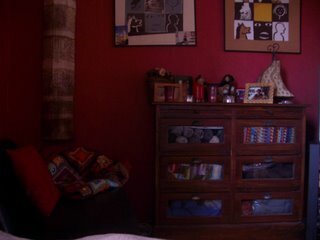 This is the cupboard in my livingroom, filled with oddballs, or special yarns, just enough for small projects. It's next to my TV, so when there's nothing on, I can admire my stash. To keep my resolution of knitting from stash, I swatched with a variegated cotton paired up with some Rowan kidsilk haze. 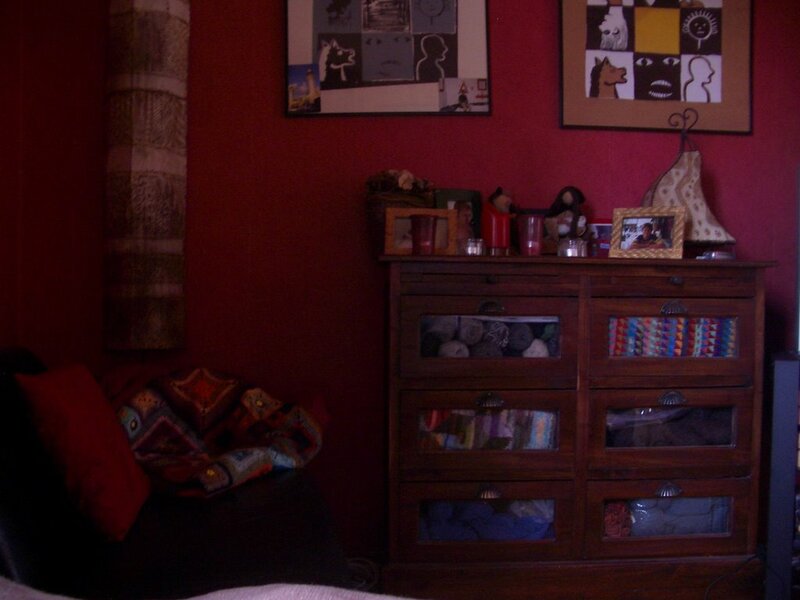 I bought the cotton in Venice in 2005. 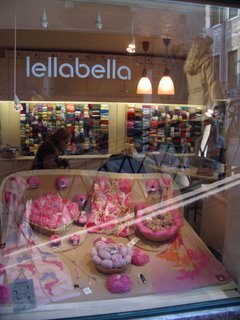 The name of the shop was Lellabella, very nice but expensive. The kidsilk haze is from my local yarnstore, 't Wolwinkeltje in Leuven. (I must write one day about the yarnstores in my home town). 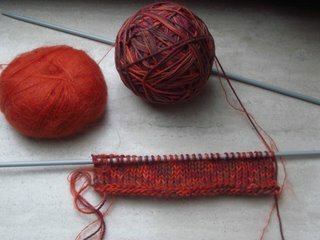 The idea was to knit 'Tamarah', but my swatch learns me that that won't work. So now I'll have to think a bit more about what to do with these yarns. And the jawbreaker cardigan is 'on hold' now. I finished the back, but am having second thoughts about the front. They are cut away, and slant towards the neck opening. I am wondering if this look will work on somebody who is not as flat as the model in the magazine. GREAT Blog... unfortunatly my Blog is on Yahoo... "Paiges hobbies" so I don't know if this will go through. You had mentioned a "Knitters Vacation" in Europe? I would like to email you about this possiblity. I live in Virginia, USA. The socks look great....bummer about the dyes transferring. Try old fashion wax paper on your needles; it seems to clean them up.